Reliance Jio 4G Plans: Reliance Industries chairman Mukesh Ambani announced the Reliance Jio Internet Data Tariff Plans and related services at the annual general meeting (AGM). He said that Jioservices would be available to every 4G smartphone owner from September 5. Reliance’s new venture Jio is giving very strong competition to its rivals like AirTel, Vodafone, Idea, and others. With the Jio Welcome Offer, Jio users will enjoy free data, voice, video, and some Jio applications and other content till 31st December 2016. After that, new plans will be applicable. On an average, the telecom company is giving the bouquet worth Rs 1500 for free to all active users until 1st January 2017. In other plans, there are free unlimited local, and STD 4G voice calls (VoLTE aka voice over LTE) and roaming free across the nation. The plans start as low as Rs 19 to Rs 4999. The lowest Rs 19 plan is for occasional data users. It will give 100MB 4G data and unlimited at night (2 am to 5 am). It also covers 200MB Wi-Fi data (via JioNet Hotspot app), Jio apps subscription worth Rs 1250, and unlimited SMS (local and national). It comes with a validity of just one day. Then, comes to the Rs 129 tariff plan which has 750MB 4G data + unlimited at night. There is also a 1.5GB Wi-Fi data (via JioNet Hotspot app) and has a validity of 7 days. The rest features are same as of the Rs 19 plan. Then, there is a Rs 499 plan in which users will get 4GB 4G data the in the daytime and unlimited access at night for 28 days. There will be 8GB Wi-Fi data. 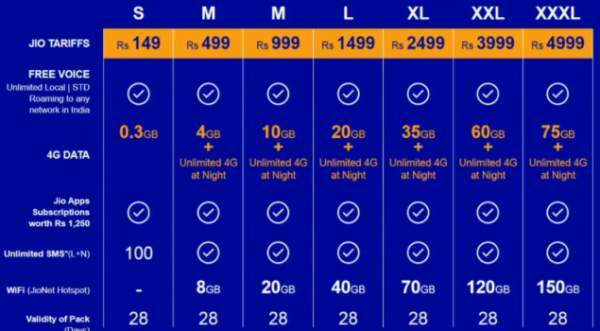 Then comes the Rs 999 plan which will provide 10GB 4G data, 20GB Wi-Fi usage and unlimited usage at night. Other plans include 20GB for Rs 1499, 35GB for Rs 2499, 60GB for Rs 3999, and 75 GB for 4999. All of them will get an access to twice the data on Wi-Fi. The plans mentioned above are prepaid. The postpaid plans will be same, but they will include taxes too. Moreover, students will get 25% more data on all the Jio tariff plans. So, anyone can visit the Reliance Digital or a Reliance Digital Xpress Mini store to avail a free Reliance Jio SIM. A valid photo ID proof, 2 passport size photographs, and an address proof will be required at the time of availing the SIM. After activation, the users will have to verify the SIM via a phone call. Users will need a 4G VoLTE handset for calling purpose else they will have to use Reliance JioJoin app and configure the handset with it. As of now, Reliance is offering free SIM with a majority of handset manufacturers like Xiaomi, Motorola, Samsung, Reliance Lyf, Sony, Panasonic, HTC, etc. After September 5, users can go to store with any LTE smartphone to get the free SIM.